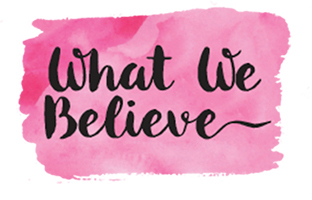 Hey friends and readers of the adorable Crafting Chicks! 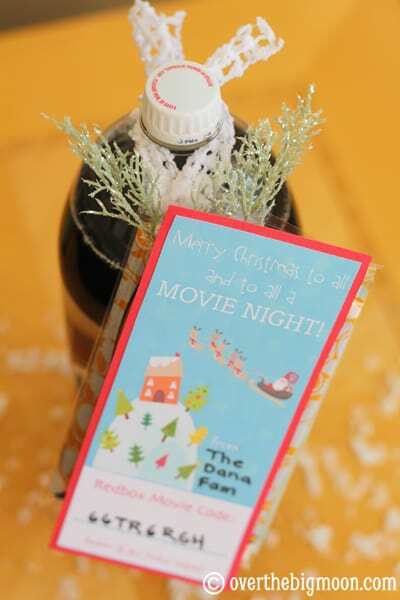 I am Pam from Over the Big Moon and I am excited to share with you this Redbox Neighbor Gift Idea! This idea actually came to me in the early hours of the morning, after being up all night with my daughter. My poor Dylan girl had been screaming her head off for the previous 5 hours (her ear drum ended up bursting) and I was beyond exhausted and as I laid down I glanced at the Redbox case that was laying on my dresser and *BING* the idea hit me! 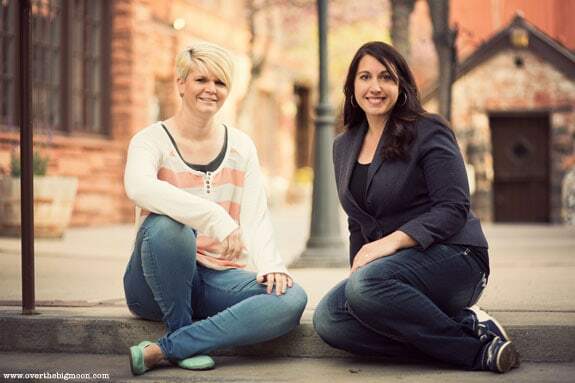 Both my blog partner, Lisa, and I are busy wives, moms, bloggers, housekeepers, PTA helpers, involved in our churches, taxi drivers, etc and so we LOVE SIMPLE! But, when the idea is simple, affordable and memorable then we have a win-win-win, which makes us beyond happy! So, I was super excited a few weeks ago when this idea popped in my head! After you have the Gift Tags all printed and signed then you just need to write in your Promo Codes! Here is how you go about obtaining them! 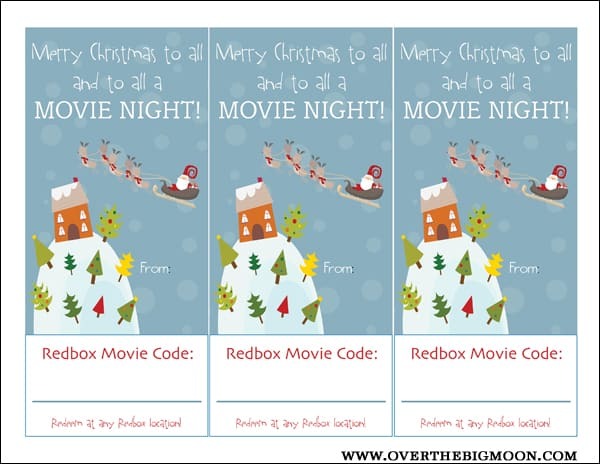 Redbox allows you to purchase them on their website in bundles of 5, 10, 20 or 50 under their Redbox Gifts section (link at the bottom of the page). You order them online and they are emailed. So, you just enter your own email address in the recipient space and you’ll receive an email with all the codes listed! Here is a sample of the email you will receive! In case you didn’t look closely, I’ve got 5 FREE promo codes in the above confirmation that are up for grabs to the first people that see them! Don’t forget that you can always reserve a movie online!! 😉 Enjoy! Now, back to the gift! 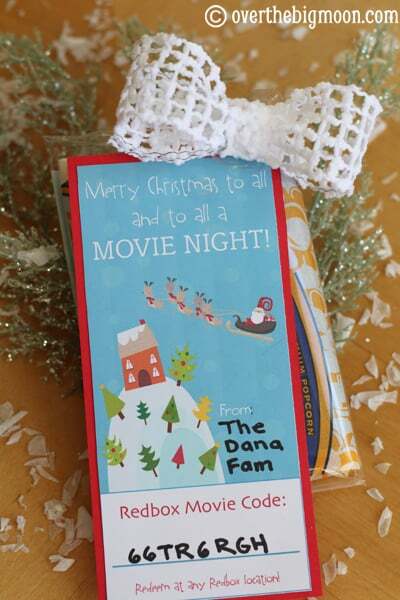 After you get all your gift tags completed, then just attach them to a package of microwave popcorn! If you purchase the microwave popcorn in bulk, then you can get them for about $.50 each (or less). So, the total cost for the gift, including the printing of the Gift Tag would still be under $2.00!! If you have some people on your street that you don’t really know, but want to be a good neighbor, I think it would still be fun to just attach the Gift Tag to your families Christmas Card! If you want to make the gift a little nicer, then you could also include a 2-Liter Soda, a bag of candy and even some popcorn containers! The options are endless! 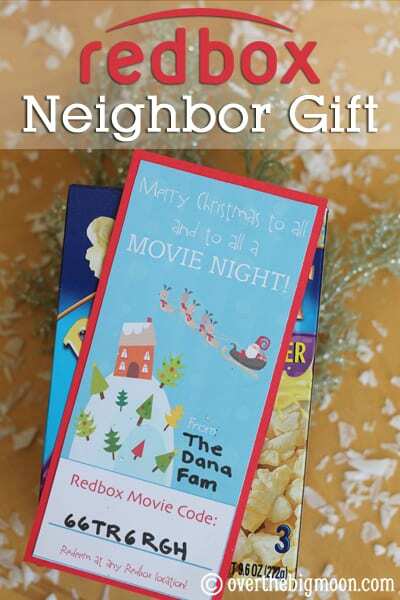 Now, get going, by downloading your Redbox Neighbor Gift Tags below! Thanks again to the amazing Crafting Chicks for having us today! Be sure and visit us on our website, Facebook, Instagram or Pinterest (Pam/Lisa)! 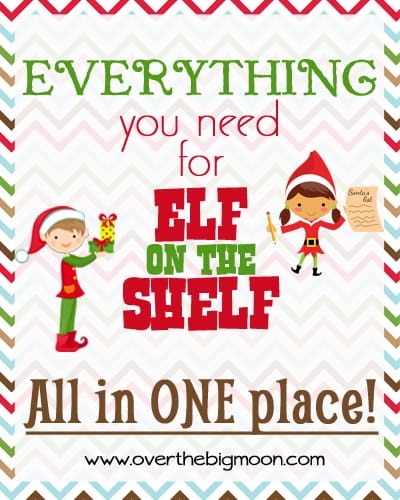 Everything Elf on the Shelf ALL IN ONE PLACE! 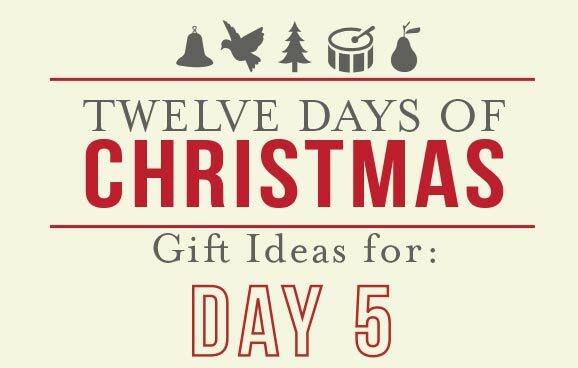 Find more 12 Days of Christmas Ideas here. This is a great idea! Thank you for sharing! I will be sending redbox codes to all my neighbors! Now I won’t have too cook a million plates of cookies and ruin my diet! I LOVE this!! Thank you so much for sharing with us!! This will work perfectly for my 4 year old daughters letter “N” week!! I had no idea Redbox did this! I LOVE this and will definitely use it this year! I’m a pre-school teacher and this is what I was doing for my kids for their gift. I was so excited to see a printable. I had to email redbox to find out if they had some sort of way I can do this as I have 20 kids and their least amount was like $10. They emailed me back and told me to do it this way. Thanks for the printable. This is something I would be excited to get from a neighbor. Pinning! This is absolutely GENIUS! I love the idea, and my neighbors will too. 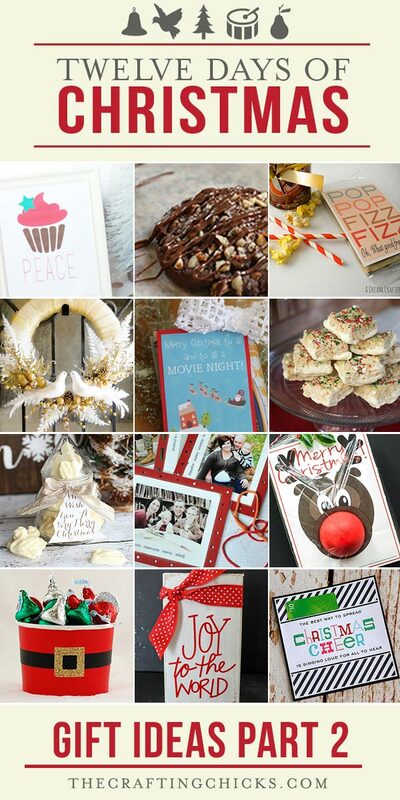 I downloaded the gift tags, and there is a grid around Santa and the reindeer. I tried converting file format, but can’t get rid of the grid. Do you have any suggestions? Hey Heather! I had a few complaints about this.. I’m not 100% sure what the problem was. But, I went in and re-exported and re-uploaded the file and then had a handful of friends check the download and they were all fine. Please try again! Sorry about any inconvenience this may have caused you! Thanks so much! I can’t get the gift tags downloaded. Would it be possible to email them to me. Thanks tons! Does 1 promo code equal one free movie? How does this work? Yes, 1 promo code does equal a free rental it’s like a coupon code. You enter at check out. I just purchased a set for my son’s teacher but after reading the fine print, I’m charged late fees if she doesn’t return the rentals after the first night…this could end up costing me a lot more than intended. Any suggestions on how to avoid this? 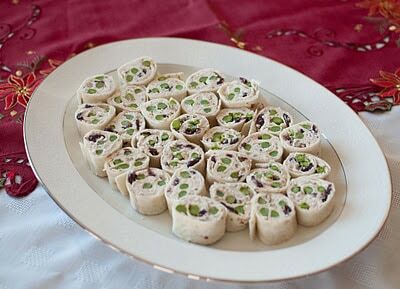 I love this idea for distant relatives as well! But I was just wondering if the person doesn’t return the video on time will it charge my card? I have not used redbox before so just wondering how this all works? 🙂 Thanks! No, they will still have to use their credit card to reserve the movie, but the promo code will bring their cost to $0. So if they don’t return it on time their card will be charged, not yours. I’m wondering if the code can be entered online as a purchase before picking up the movie, or do you have to type it in at the kiosk? I think it can, but I’m not 100% sure. How long are these promo codes good??? Thanks so much for the cute way to give them the codes! This is AMAZING! Thank you so much for sharing! Every year I think I’m going to make tins with cookies, fudge, and other holiday treats for my awesome neighbors (and they really are awesome) but being a full time working mom of two, I never end up having the time! This is absolutely perfect and cheap enough that I can do it for all my neighbors AND co-workers Thank you again!!! I love the redbox promo code idea! However when I go to the site I only see an option for gift cards. Please help! I am also having the same problem. Did you get it figured out? Do you know where I can find a non-christmas version? I have a few coworkers that are Jewish but I love this idea. I would love to use this for gifts but I am also only seeing the option for the gift cards not the codes. Please HELP! I thought the same thing but when I googled redbox bulk codes, I found it. This is an amazing idea! Thank you so much! I finally have a gift for coworkers! Who DOESN’T LOVE a free movie night? Sheesh. Pure genius! 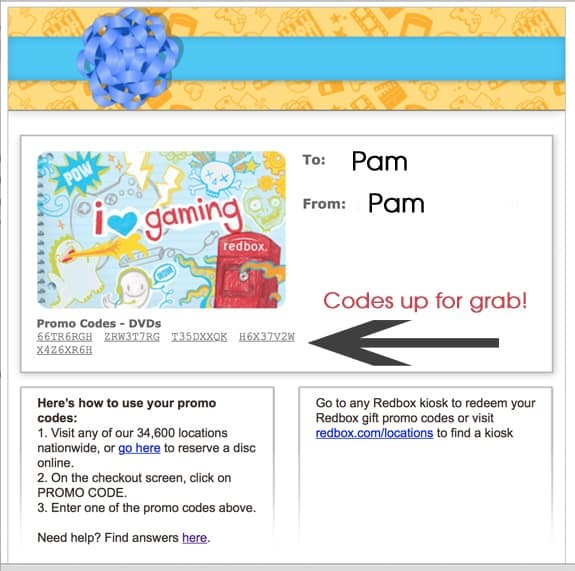 Since it says on the Redbox website that the codes do not expire…does that mean we can use your 5 free codes as well??? The codes are single use only. They don’t expire, but each code can only be used once. Thanks for sharing the tags, saves me the time of having to make them myself!! I’ve done this every year for a few years for my kids teachers. It’s a fun, easy, gift to say thanks and offer up some entertainment over the Holiday Break! I love this idea! Like others, I can’t get the download to work. Can someone please email it to me? Thank you!!! Did you get a copy of the tags? Could you e-mail them to me, if so? Thanks! I can’t download these either. 🙁 If anyone is able to email the file to me, I’d be very grateful!! [email protected] Thanks!! I can’t get the gift tags for the redbox gifts either. I am ready to go with everything else, but my computer won’t allow me go download the gift tags. Could someone please email them to me and hopefully I’ll have better luck! Thanks tons!! Very appreciated! Any chance you can email me the download? I’m unable to download? Thanks so much!! Love this idea and the printables!! I also tried to download the printable, but was unable to open it. Any suggestions? It’s such a cute card, and I plan on making baskets for my daughter’s preschool teachers. Thanks! I am trying to print off the redbox gift tags and mine will not load. Tried multiple devices and none of them working? Any suggestions? Please help! I can not get the printable gift tags to download either. Any suggestions? Could it be emailed to me? Email is [email protected]. Any help would be very appreciated. Thanks. I love this idea and tags! Any chance you know what font the “Merry Christmas to all…” and the “Redeem at any Redbox” words are in? My computer must not have this font, so it tried to switch to another font, but now it’s unreadable. I see this is from last year, but worth a shot! Thanks! I went over to Over the Big Moon website and did a search on her page for redbox. It pulled up her current blog, which also included a link to last year’s downloads. She has four different printable templates to pick from. The new one this year is really neat. Good luck! I love this idea! I just want to say thank you for the free printable. Thank you so much for the idea and the printable. You saved me! I am using this for my coworkers and neighbors. Thanks again! These are so great! Thank you for the printouts.